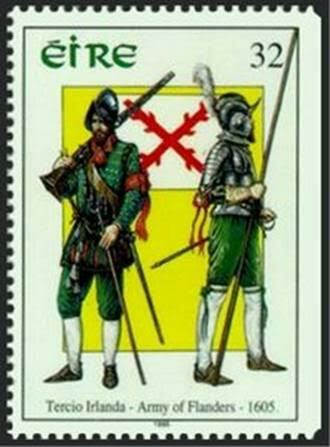 A stamp commemorating the ‘Tercio Irlanda’. From 1587 until well into the 19th century, Irish regiments existed in Spanish military service. Here William Marmion gives a brief overview of these units. Since the days of the Desmond rebellion, Catholic Irishmen left Ireland to fight fro Spain. While some of these units -notably that of Owen Roe O’Neill are comparatively well known, others are not. There were a number of Irish Regiments (or ‘tercios’) from the year 1587 which remain basically un-researched. This paper will not pretend to do that job, but will try to outline what the area of study can be. General histories of the period have outlined how Irish Catholics served Spain, both to fight their political and religious enemies in England, in the hope of winning back confiscated lands and also to advance careers blocked in Ireland by anti-Catholic laws. Others of course, frequently the followers or tenants of the great families who led the Irish regiments, served merely to make a living – though even they do seem to have seen themselves as self-consciously Catholic Irish soldiers. Most served in the Army of Flanders, attempting to put down a Protestant revolt in the Spanish Netherlands. 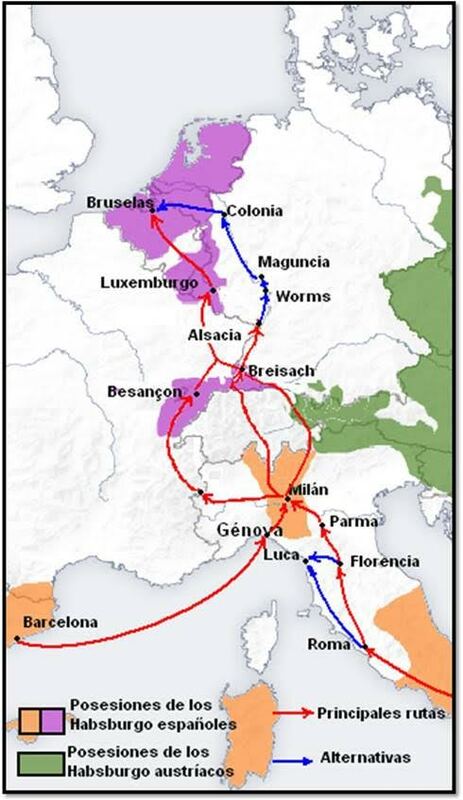 The routes taken by Spanish troops to Flanders. In short, it is only within the overall European and Irish context that the Wild Geese service to Spain can be seen clearly. But what is still missing is as said a detailed look at the men within the particular regiments, along with the study of each regiment’s battles, victories, and defeats. Having said that we do have the recent wonderful source which did identify many of the Wild Geese in Spanish service, that is the IRISH IN EUROPE PROJECT. That project was outlined in an article on General Michael (Miguel) Marmion which The Irish Story published on 11 March 2013. As said in that article, the amount of detail on each person is sparse. And with some exceptions (those mentioned in Jennings’ book for example) does not deal with Irish enlisted soldiers who served in Flanders or with any grouping of them into particular regiments. And on that absence, it must also be said that the Spanish Military Archives in Spain does not have the service records of the Irish soldiers who served in the Regiments of Flanders. The Spanish basically left the head-counting and individual identifications to the Irish Commanding Officers of each Irish regiment in Flanders, with whom Spain had contracted. Additional detail on Flanders soldiers would exist mainly in the Belgian archives in Brussels, and it is there that the heavy lifting of research must take place at the end of the day. Yes, those archives have been looked at and referenced in the books mentioned above, but not from the standpoint of writing individual regimental histories or even of listing many of the individual enlisted soldiers though many officers have been identified. A ‘regimental history’ approach would necessarily include much more on individual soldiers (and their families). And that is what is recommended, thus this ‘outline’ which I hope will stimulate the further research necessary. This was the very first Irish regiment in Spanish service. It entered the service of Spain in 1587 by the whole regiment ‘going over’ from fighting with England’s allies, the Dutch, to rather serve Spain. Sir William Stanley himself, an English Catholic, had been allowed to recruit Irish soldiers (1585) and then transport to Flanders. The regiment lasted until 1600 in Spanish service, when the Spanish themselves became very anxious for new recruiting in Ireland for Flanders service, after the loss of O Neill at Kinsale in 1601. A list of the officers in Stanley’s regiment has been printed but there is no general listing of any depth. We do know that a number of soldiers from the disbanded Stanley Regiment did enter the O Neill Regiment. The largest Irish regiment was raised by the prestigious O Neill family. This regiment was the first formed after Stanley’s and made solid the practice of naming the regiment after its commander or founder. The founder was the 2nd son of Hugh Prince of Ulster (Earl of Tyrone his discarded English title), The O Neill. That son was Henry. It was formed in 1605 while his father was still alive and just before The Flight of the Earls in 1607. On Henry’s early death in 1610 at age 23 the commander became John O Neill, his brother and the youngest son of Hugh. But being young (born Dungannon 1599, died in battle in Spain in 1641), it was in effect commanded by a cousin, the to-be-famous Owen Roe O Neill, who stayed in command until he himself went back to Ireland in 1642. There he effectively lead Irish troops fighting in the uprising which had started in 1641, and which lasted until Cromwell came. Owen Roe himself died in 1649 and that in itself was a turning point against the Catholic Confederation. In 1623 the regiment in Flanders had a total complement of 1274 men, declining to 1095 by 1639. The regiment from 1642 was then commanded by Patrick O Neill, a kinsman of Owen Roe, and had a complement of 614 in 1644 declining to only 200 by the summer of 1646 (all the figures mentioned herein are taken from the book by R.A. Stradling). Regiment of Hugh O Donnell. In 1636 this regiment along with that of Owen Roe O Neill above, and Thomas Preston and Patrick Fitzgerald following had a combined complement of about 7000, all coming to Flanders via an agreement of the Spanish with King Charles I of England. O Donnell’s regiment was drafted into service in Spain itself in 1638 and thus out of service in Flanders. It had a distinguished record in Spain. This was formed by a former subordinate of Owen Roe O Neill, starting in 1632. It is included in the overall complement of the four Irish Tercios of 7000 in 1636. It should be stated that the 7000 figure declined to about 2500 by the end of 1639, due to losses in Spain’s renewed war with France and movement of some directly to Spain. The complement of this regiment was also included in the overall figure of 7000 in 1636. In 1640 the regiment was as Hugh O Donnell’s removed from Flanders to the Spanish mainland, and also had a distinguished record. After the defeat of Catholic forces in Ireland by Cromwell, regiments such as Murphy’s were raised from fleeing Confederate soldiers. The 700 soldiers of this regiment were those remaining from that formed in 1644 by the Earl of Antrim to fight in Scotland. That formation was approved by the Catholic Confederation which had royalist members supporting Charles I before he was beheaded. 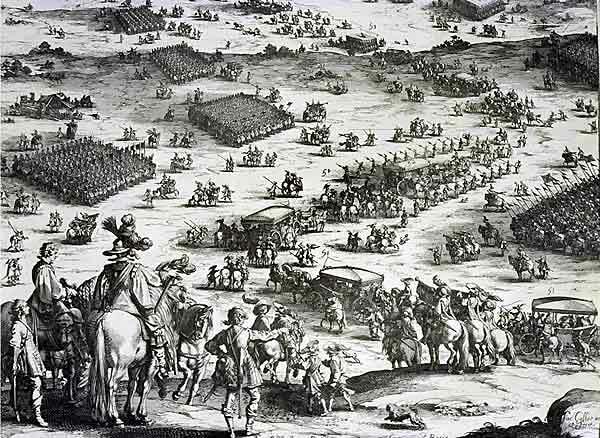 After winning several battles, the regiment (originally 1600 men) found itself isolated and surrounded. Rescue was finally accomplished in late 1646 with Murphy and his men entering Spanish service. Murphy was to be a fixture of the Irish continuing presence in Flanders, still commanding 700 men in 1654, and still with a regiment in his name as late as 1659 with a mention of a new colonelcy even in 1667 in Spain itself. He had taken over the regiment of Patrick O Neill (the original Owen Roe regiment) which as stated was seriously depleted down to 200 by the summer of 1646. 1653-54 saw a great influx of Irish soldiers into Spain, as a result of losing the war back in Ireland to Cromwell. About 14000 went to Spain itself, but about 2300 went to Flanders. The regiment of D. Costello was one of these, with 732 men. Likewise entered into Flanders in 1653-54. A small ‘tercio, only 274 men are shown as the complement. Regiment of P. O Reilly. This body of men originally landed in Spain, but was sent to Flanders in August of 1654. The complement was 649 men. The commander, Philip MacHugh O Reilly had served continuously in Ireland from 1641. There were in total 26 Irish regiments in Spanish service, some of which are little known today. It should be noted that there was also an unnamed regiment listed in 1653-54, with a complement of 600. And in December 1654 Colonel Murphy’s regiment is shown with a strength of 700 and O Reilly’s with a strength of 1000. And it should be said that Spanish needs declined in Flanders resulting from peace with France and partial Dutch independence, so that in 1657 there were only 1200 Irishmen in one remaining regiment (probably Murphy’s). By July of 1665 an Irish presence was essentially gone from Flanders, as the ‘group’ headed by Thomas Nelson showed a complement of only 37. The above are the major regiments which were in service. There are references to there having been up to 26 regiments in total, but some of those were in name only and did not have the necessary manpower to be of full regimental size. For example, we see in December of 1646 that men of the ‘Regiment of O Sullivan Mor’ were transferred out into other companies, including that of a Captain Dominick Marmion. This O Sullivan Mor was also identified as being at Ostende (near Dunkirk) with 524 other Irish soldiers commanded by a Captain McDonnell, in 1631. That group would ostensibly have been from the Regiment of O Neill. Much amalgamation obviously took place, of small units and of individual soldiers or immigrants from Ireland. B. Jennings mentions those units in 1947 and 1948 articles in the journal Studies. This is obviously only a short sketch of the various units which made up the Irish presence in Flanders. It is hoped that it will stimulate interest and will result in further research and eventually into detailed (as far as possible) regimental histories. This sketch does not mention the much more numerous Irish presence in units which served completely on the Spanish mainland, particularly in the war of the Catalan uprising (1640 to 1659 resulting in Spanish victory) where the Catalans were supported by the French, or the service of Irish units in the war against the Portuguese (1640-1668 resulting in Spanish defeat and Portuguese independence once again). One Response to "IRISH REGIMENTS IN THE SPANISH ARMY OF FLANDERS"
Excellent. Thank you for the article. I’d like to hear more about the archives. If you would, please contact me at b.e.cassity@gmail.com.